Finally, a military pilot steps forward and completely blows the lid off the unlawful and exceedingly destructive Global Chemtrail Program. What follows is a video which puts forth a true story about a courageous pilot who has broken ranks with his chemtrailing peers. In so doing he has risked his life and the life of his family. As you listen to this presentation, or read the text provided below, bear in mind that chemtrails are being sprayed 24/7 around the globe with terrible consequences. For those uninitiated in the ways of atmospheric engineering, chemtrails are but one geoengineering technique that is being systematically used by the U.S. Military. 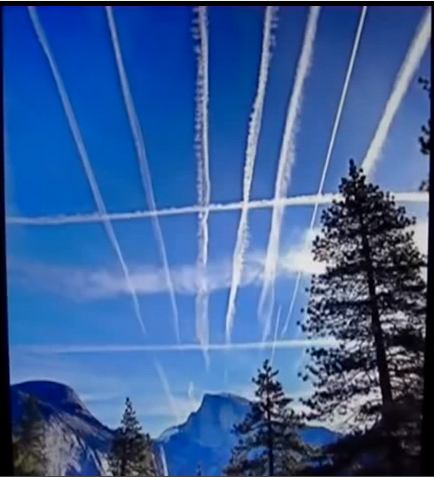 The following link provides an excellent overview of the geoengineering/chemtrail phenomenon, as well as an exceptional photo-doc. After all, only seeing is believing … for most people! No matter what the stated reasons are given to those who fly the chemtrail jets, they are always told by their superiors that this ongoing and illegal atmosphere-altering program is being conducted in the interest of NATIONAL SECURITY. You’ll notice that NATIONAL SECURITY appears crooked because the whole intention behind geoengineering is as dangerously misguided as it is deceptively false. The indiscriminate, wide-area and systematic spraying of toxic aerosols throughout the skies of the world couldn’t possibly have anything to do with ‘national security’. Those that buy into such a ridiculous notion have obviously been either brainwashed or bribed into believing such an absurd and nonsensical agenda. That’s precisely why this unprecedented exposé is so important. Never before has anyone directly involved with the piloting of chemtrail airliners ever gone public. Not only does “Blue Jay 1”, as he is known, go public, he completely blows the lid off of OPERATION INDIGO SKYFOLD. This single act of identifying the name of what is perhaps the most destructive government program in recorded history is extremely critical. Because it now gives the worldwide anti-geoengineering advocacy groups a target to hit within their own nations and governments. How, after all, could government officials and political leaders at every level — federal, state, county and city — be so clueless about a massive aerosol spraying program that is going on in the skies right above them?! Can any responsible representative continue to plead such ignorance or indifference and get away with it? That’s why this critical development is so huge! Really HUGE! It is what we have all been waiting for, yet so few in the movement really get it. Which is why this particular message has to be taken to the wider public. Because at the end of the day — every day — every human being on every continent will REALLY abhor two things about the now ubiquitous chemtrails. I. Chemtrails routinely transform warm sunny days into cool cloudy ones. No one likes to see their clear sunny days stolen after a couple of hours of chemtrailing. Day after day of overcast skies have profoundly changed many a locale which have traditionally experienced clear skies. Is there anyone who prefers damp cloudy days to dry sunny ones? Certainly the people of Florida and California want their fun in the sun! So does the rest of the USA. II. Chemtrails contain a mix of toxic chemicals and poisonous compounds such as barium salts, aluminum oxide, strontium, mercury among many others, which eventually end up falling to Earth. The chemtrail mix of toxins inevitably leaves its residues on farm fields and forests, lakes and ponds, and lawns and gardens. How does one possibly stop the noxious chemicals from entering one’s home and automobiles, office building and shopping malls? Who ever wants a toxic chemtrail brew dropped on them every other day?! Geoengineering has proven — unequivocally — to be extremely detrimental to both human health and the greater planetary environment. As for the many adverse health effects, the link below gives an excellent summary. For those who did not watch the video shown above, the most important text is provided below. Information below was received by the cousin of an actual pilot who flies chemtrail jets and is working on the inside. The operation is known to pilots and aviation crew alike as ‘Indigo Skyfold’. Pilots are told to fly specific routes, while satellites control aerosol dispersal patterns. The pilots make course corrections from time to time, and perform landings and takeoffs. Pilot navigation and maintenance crews are rotated constantly, and only spend about 18 months at one given base, to keep pilots and their families from making too many friends, and ending up with “loose lips”. They also rotate between day and night flights, one base for daytime flights, and one for night. Each base covers a 250-mile zone, and each fleet (squadron) of planes covers three states, or an even larger swath of ocean. Their superiors tell them it’s a matter of National Security. Sounds more like a PR statement to me. I think this pilot, either believes what he is told. Or, he is simply trying to sugar coat their Genocide Project. My firewall detected multiple intrusion attempts when I googled the Indigo code as well. Zero info to be found on the internet for this operation. That is unique. “First of all I would like to say that I do not agree with my mission assignments, but what soldier ever truly does? Several of us have considered bucking the ranks, and going AWOL from time to time. We are kept in the dark when it comes to getting honest answers about what we are really spraying. Should they discover that we or our families are actively enquiring about the so-called ‘chemtrails’ term, then automatic and swift disciplinary action would be taken. HAARP and radar are two other non-allowed research subjects. Unless our children are learning about these in base schools, we cannot educate ourselves or our children through any public education system. I would not intentionally spray my children or family with toxic aerosols, but as you must know, perhaps 80% of the pilots do not have any family or children. Indigo pilots are chosen from top ranks within the Air Force, Navy, and Coast Guard. Most of the pilots are ‘hardened to humanity’ and could care less killing off unwanted or leaching aspects of America and the world. I swear to you, the majority of the pilots are like machines, I call them “Tanker Terminators”. I should not be telling you this, but nearly 1/3 of all flights are being orchestrated from small unnamed islands, where newly constructed bases are being built at a rate of 8 per year. On these extremely remote islands there are HAARP rays of every possible design, with many arrays surrounding these islands within the depths of the ocean itself. The Navy has developed sophisticated underwater construction technology that allows fully autonomous robot submersibles to travel great distances, and even manufacture parts for these massive underwater arrays as they progress across the open sea floor. Every time that you see or hear about military exercises at sea, they’re basically there to give support and resupply their army of underwater robotic minions. There is possibly one aquatic robot per plane, and will soon be double that. You will never be able to Google Earth or Search any of this. Other than an occasional error in blurring some island bases, or smudged images of underwater arrays, it is impossible to locate all these advanced technological devices. They even paint fake clouds over some of our island installations to keep prying eyes away. I have been shown some of these images by civilian friends. That is the reason I know this. I completely understand your concern for human safety, and here is the kicker. We are shown videos in our training of catastrophic destruction to our homeland by very sophisticated weapons, then told that these will be the consequences if we don’t fly. Our efforts in building a defensive atmospheric weapon shield are the only missions of its kind in the world. We are paid more than any other pilot for our service, other than Air Force One pilots who make as much or more and are kept in a dark, secret world for their own protection. They tell us that secrecy is our protection, and not to listen to any public rhetoric. We all know about cyber program flash-point or FP- 03 as it is known within the veteran community. This program is a self-destruct sequence that can be remotely activated from any ground, water surface, underwater base, as well as any other air mobile unit. The signal is encrypted through three satellites and cannot be jammed or blocked. At any given moment you could have only 15 seconds to make your peace with your God. They tell us that FP exists to keep planes from accidentally going down in heavily populated areas. They can remotely detonate our planes over safe zones, but in the back of your minds, our minds, we’re pretty sure this is a fail-safe program to keep pilots from turning over assets to any public, private, or civilian authorities. Have you ever seen any member of the crew survive the few crashes that have occurred? Every plane that has gone down was completely destroyed … for good reason, I am sure. We risk our lives in more ways than one, every single time we fly, especially during night flights. They are ordering us to fly at lower and lower altitudes. We feel like a massive “Dark Force Empire”of crop dusters, and know that one night Bubba, or Billy Joel, will fire there long rifles at us when we spray their moonshine-making operation, or pass over an illegal Mary Jane crop. I know for a fact that some planes have been shot at, and subsequently brought down by mostly Russian, Chinese, and Korean weaponry, but the media will never cover these events as they are not allowed to report on our flights either. That must be true, for I have yet to see a detailed or in lengthy report of our missions on any public venue other than conspiracy shows and anti-government websites. I risk everything for disclosing so much information and you will find very few like me. Even my own flight crew would have me arrested and court martialed if they knew of this dialogue. That is why I cannot email you directly, but from what your cousin tells me you are also risking everything just to get this information out to your colleagues. I salute you sir, for standing up to the establishment and Big Brother. I would love to go home tomorrow and not rack up one more single minute of flight time, except for a sweet little Piper Cub, or Rat Tail Barn Racer. I miss those beautiful blue skies from my youth, and I am ashamed for hazing over that dream. More importantly, maybe my fellow pilots will read or hear about this, and decide to come forward as well. I only know a small fraction of the larger picture, as they compartmentalize everything. Should I become aware of any new significant developments I will email your cousin. The man I have contact with says he senses a wavering within the ranks, and that a kind of mutiny is beginning to boil to the surface of this whole geoengineering global whitewashing, if you catch my drift. My cousin still has friends in high places too, so he is helping to protect the pilot. Those were his words, not the actual Air Force message. He wanted me to stress that. 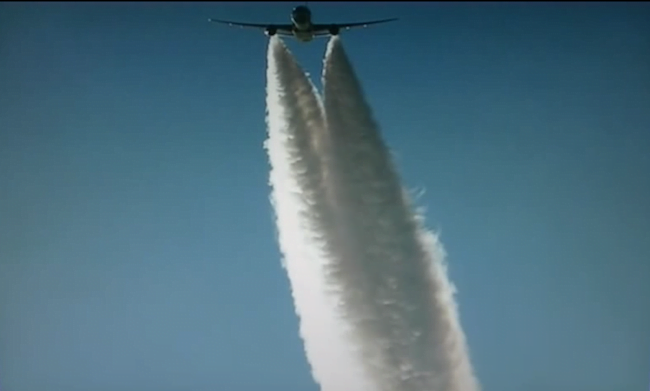 He believes that the focus of their flights will be moved to areas east of California and Texas, in order to advance the drought further into the heartland; plus, he feels that a very new and extremely toxic chemtrail mix is going to be sprayed, using new technology that makes these special chemtrails completely invisible. “Atmosphere shield of protection”, he doesn’t believe that either. So that is the end of the message from this chemtrail pilot. From my own experience I’ve had a lot of contact with this guy for six months via the Internet, and basically everything he told me has turned out to be true, so I have no reason to doubt any of this, and hope you forward it. This also points out how difficult it is to fight this program because people inside the program are not subject to public opinion or exposed to public information sources. Therefore, we need to brainstorm and come up with the way to shut down this program, as it is actually heating the planet, and killing everything with elevated UV rays, and toxic metals. An active chemtrail pilot has quite courageously stepped out of the shadows at great risk to his career and his life. Such a sacrifice ought to compel the fast-growing community of anti-chemtrail advocates to disseminate his much needed message. Raising the worldwide awareness around this pilot’s unprecedented disclosures seems essential toward shutting down the current form of global geoengineering. Operation Indigo Skyfold has been OUTED. We now know its name. We now know how it works. We have been informed that it is being expanded in 2015 and is now more dangerous than ever. Chemtrails must be stopped BY ANY MEANS NECESSARY! 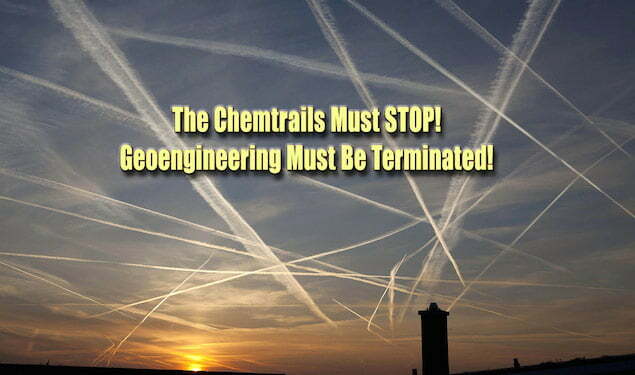 Geoengineering must be terminated BY EVERY MEANS POSSIBLE! Previous PostPrevious Will People Awaken when it is “High Time”?